Why was John Key singled out by Panama Papers hacker? Sadiq Khan has been elected mayor of London, reclaiming the post for Labour after eight years of Conservative rule and becoming the first Muslim mayor of a major western capital. Khan took 1,310,143 votes (57%) after second preferences were taken into account, beating Conservative Zac Goldsmith into second place on 994,614 (43%). His tally gave him the largest personal mandate of any politician in UK history. The 45-year-old son of a Pakistani bus driver beat Zac Goldsmith at the end of a sometimes bitter campaign during which the Conservatives accused Khan of being “dangerous” and “pandering to extremists”. Labour complained that Goldsmith’s campaign was Islamophobic. Congratulations Sadiq Khan, and bravo London. Ran on a ‘Muslim’ ticket did he? What if he’d been a Hindi, a Jew or a Catholic…or a Protestant or a Sikh? Pretty sure London elected a Labour Mayor… yes, one who is also Muslim. I’m thinking that’s probably noteworthy given the woeful state of affairs across the ‘western world’. But ‘noteworthy’ doesn’t equal elevating an aspect of a politician to a headline that, by being a headline, casts said aspect into the realm of defining characteristic or feature. Or maybe I’m having a sensitive Saturday? No only labour, but a labour member who hates how the likes of Blair distorted, then almost destroyed the party. heads would splode n stuff. The most important campaign issue was housing (NZ Labour and National take note). But as in NZ, the power to make radical changes about housing lies almost entirely with parliament. 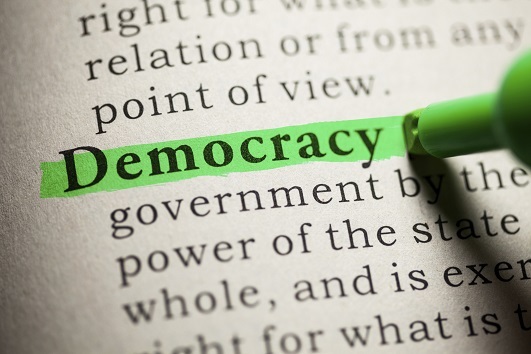 It’s the same there and here: Destroy democracy by destroying local government. Good ol’London, turns out the gold pavements once again. What a result, well done brave and fearless Londoner Sadiq Khan. Here we go. Will Key give Crosby another Knighthood? What’s his political background and track record? this might be a good start? Nope. i knew the bio stuff. I’ll check his campaign site. He is not a Blairite. Father was a bus driver. Zac Goldsmith was in the past a halfway descent Tory one of the few who understood AGW and environmental issues having been Editor in Chief and Director of the scientific journal The Ecologist. Sad to see that his association with Crosby/Textor who must now been seen as the most toxic of people. Their slime obviously oozes everywhere. What a choice – someone who’ll maintain Tory standards of governance, or someone who might introduce Pakistani standards of governance. I guess if I was a voter I’d go with Khan – at least with him there’s a “might” in there. Read Sadiq’s manifesto on Ad’s comment 9. He is a Londoner, simple as that, just not a tory londoner. 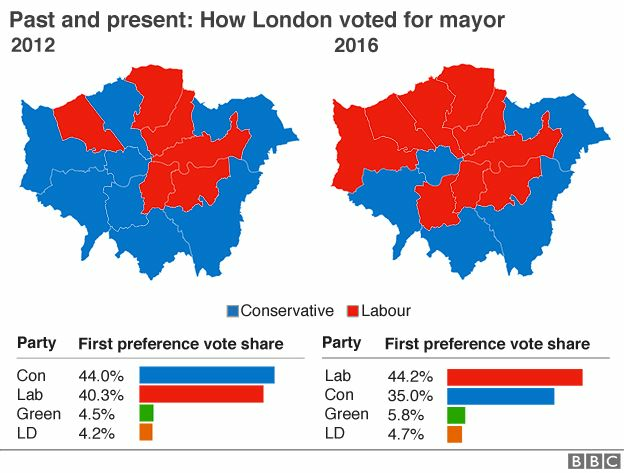 Khan sweeps north London and makes inroads south of the Thames too. if he does the housing section well he will be remembered. See my comment 1.2.1 above. Only parliament has the power to make the significant policy changes required. No, they have a far more empowered Mayor than here. He’s got plenty of power to exercise for good. It was revealing watching RT News (Sky Channel 92) reporting Khan’s victory. There was a “discussion” between the news reader, an English Muslim commentator and a representative of a right wing group, the English Democrats. The latter described the result as “London’s worst day since the Blitz”. He was extremely angry about the result and could not see how a Muslim had won. When he was finally persuaded to desist from yelling over the Muslim commentator, the latter calmly pointed out that, in his opinion, the electorate had been attracted by Labour’s policies – the candidate’s religion was of little relevance. Yep that interview was also on RT’s youtube channel. Rotterdam is the biggest European harbor and a huge city and has happily had a dual citizen Moroccan Muslim mayor! He is Muslim, Labor party, has been a state secretary and was appointed in 2008. He is also an accomplished poet and translates poetry from Arab to Dutch. He spoke on the 4th of May which is WWII commemoration day and is a respected member of Dutch society. What is interesting is that London picked a Muslim from humble beginnings over a Jewish Tory banker married to a Rothschild. Maybe people are getting sick of the Anti-Semite manipulation Schtick! Amsterdam is the capital of the Netherlands, not Rotterdam. Hup Ajax! The Islamisation of the West is on target, Europe’s conquest is a fait accompli and the glories of Islam will be visited on infidel nations. It will soon share the same level of civilisation as the Middle East and North Africa.